To spark discussion, the Walker invites Twin Cities artists and critics to write overnight reviews of our performances. The ongoing Re:View series shares a diverse array of independent voices and opinions; it doesn’t reflect the views or opinions of the Walker or its curators. Today, Minneapolis-based experimental playwright and performance-maker Rachel Jendrzejewski shares her perspective on The Object Lesson by Geoff Sobelle. Agree or disagree? Feel free to share your thoughts in the comments! I arrived at the Walker just minutes before Wednesday night’s performance of The Object Lesson was meant to begin. Normally, running this close to late for a show in the McGuire Theater would mean quietly slipping into a seat toward the back as the lights go down. Rolling into the theater that evening, however, I quickly realized I was in for a different experience. The theater was empty when I arrived. No people at all. The stage curtain was closed. Large cardboard boxes were scattered everywhere, piled up in the seats. Where to go? What to do? I caught a glimpse of an usher’s elbow in a doorway way down near the edge of the stage, so I crossed over to meet her. She directed me around the corner, onto the stage itself. By now, you likely have seen remarkable photos, like the one above, floating around online. 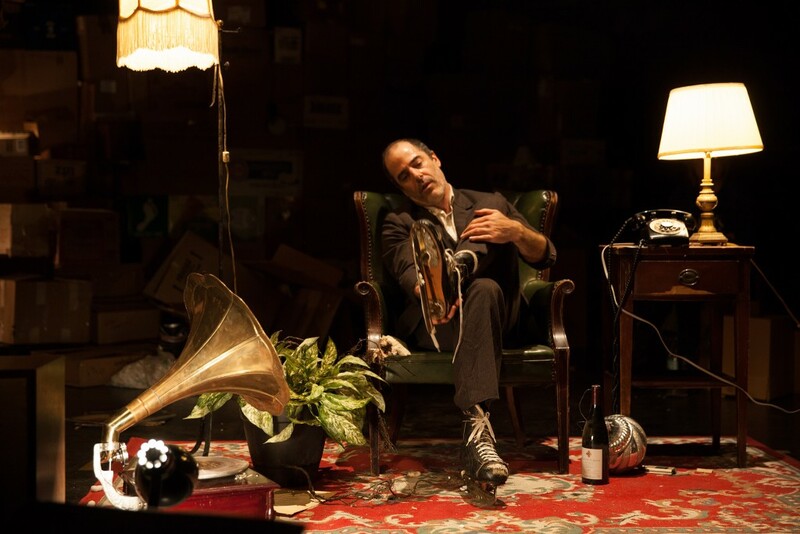 The stage was no longer recognizably a stage, but a cavernous room designed by Steven Dufala, warmly lit and filled to the brim with stuff—thousands of cardboard boxes, an array of mismatched furniture, and countless miscellaneous objects. Everything seemed to come from another time: toys from the 1980s, old school library card catalogs, lamps and music-playing devices from nearly every decade of the twentieth century. “We’re encouraging people to move around and explore during the performance,” noted the usher. 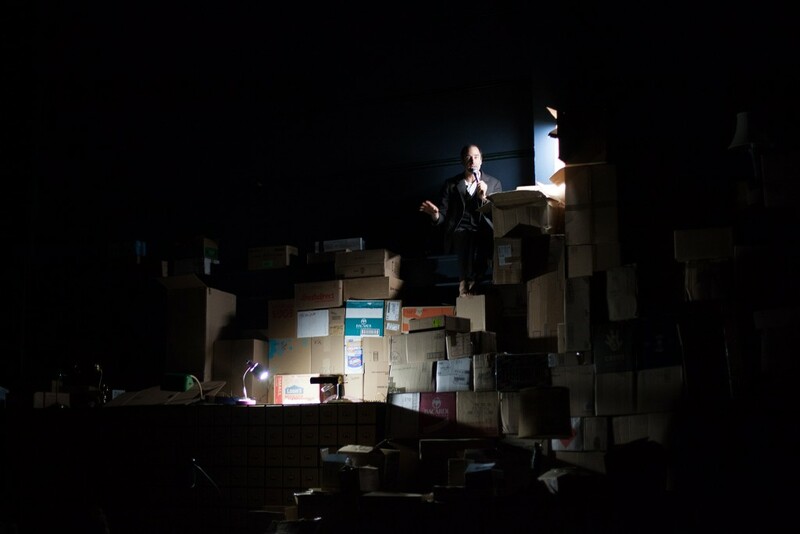 And indeed, the audience was moving comfortably through the space, reading aloud the handwritten labels on the boxes to each other (“Paris,” “Stuff that used to be important”) and unabashedly snooping through the clutter. I ran into to a friend who had just found a bunch of tax returns. “They seem real,” she said. “He made $16,000 in 2004.” To enter this space alone might have been eerie or overwhelming—I had flashes of the recent NYT feature about people who die alone—but with dozens of people milling around and chatting, many drinking wine from the bar, it actually felt like walking into a rather pleasant house party. People hanging out before dinner. The vibe was warm, convivial, and full of anticipation. What’s in this box? What’s in that one? What is going to happen tonight? I noticed a Discman with headphones resting atop a stack of boxes. Next to this setup was a CD case which, for some reason I can’t explain, I registered to be a classical piano album. I put on the headphones and hit play. Music played, but it definitely wasn’t classical piano. “Does it work?” a fellow audience member asked. “Yeah,” I replied, “But I don’t think that CD is what I’m hearing.” “Really? Are you sure?” I looked more closely at the case and realized it did, in fact, belong to the album I was hearing: Jethro Tull live at Carnegie Hall. I must have looked confused. “Do you not know Jethro Tull? !” he asked. “No, I mean, I thought…” Suddenly he picked up the box, Discman and all, and shoved it into my arms. “You better take this with you.” Then he produced a Victrola seemingly out of nowhere and started arranging furniture to create a kind of makeshift parlor. The man wasn’t a fellow audience member at all, of course, but Geoff Sobelle himself—and the performance was beginning. From here, I’m realizing that I actually don’t want to say anything about what happened in the piece, because constant surprise and the palpable live-ness of people sharing the experience in real time were so fundamental to this work’s DNA. I keep typing out specific images and events, then deleting them; to name them feels diminishing. I’m thinking back on Miranda July’s request that nobody write about New Society for a year, so as not to spoil the newness of the experience for others. I remember appreciating that request—let the surprises be kept secrets for each audience, stay present with the work—and now, I’m craving a similar rule for The Object Lesson, even though Sobelle has made no such request, and despite the fact that many of the show’s magic moments already have been spilled online. By the way, when I say “magic moments,” I mean actual magic. Sobelle and his director, David Neumann, worked with “Illusion Consultant” Steve Cuiffo to create countless wondrous instances of “How did he do that? !” How did he pull that very large thing from that very small box? How did that audience member he put on the spot know exactly what to say, in a way that worked perfectly with his own clearly scripted text? The tricks are intricate, seamless, and utterly captivating. Here is something I will say. A good majority of the evening involved watching Sobelle interact with objects, and I could watch him do that for a very long time. In many instances, his tightly crafted material world felt like a charming portal into a deeper layer of inquiry, addressing more unwieldy things that, ironically (or appropriately), can’t ever be fully contained in tactile form: wandering, love, masculinity, aging, death. I thought about the winding trajectory of any life: how constantly we experience, how hard we try and love, how much we’ll never know. How, when we look out at the night sky—or get lost watching a stoplight change from red to green to yellow—we’re reminded that our lives are teeny tiny blips in time. Is that recognition comforting or scary? How do we spend our blip, and why? There we were, mostly strangers, spending some of our very limited time together, laughing, with all the things. I wondered about Sobelle’s relationship to uncertainty; he has the wistful eyes and sweet ready smile of a clown whose drive to entertain might be, in fact, a survival mechanism. And when I say “clown,” I mean Sobelle is an actual (expert) clown. Some of the most compelling moments in the piece were those in which he let clown logic completely take over—innocently repurposing objects, inviting us to see their hilarious and sometimes poignant unexpected potential. As a colleague observed, most of us will walk into that installation and feel some sense of weight from all the clutter. We know that hoarding too much stuff isn’t good for the soul. We know that memories attached to certain objects can become overwhelmingly heavy. Yet Sobelle invited us to shake off those memories, let go of that baggage, drop all our assumptions about stuff, and instead experience each small offering anew. That was the real object lesson, I reckon. What’s a telephone, anyway? Smell this jar of dirt! What can ice skates do? Over the course of the evening, our relationships to objects were not illuminated so much as transformed, reinvented. In turn, I left the theater and saw the world itself anew.